Josh Cook is a 34 year old self taught avian behaviourist, specialising in the art of free flight, a relatively new concept within aviculture and companion bird ownership. His work is based on the formation of a strong understanding and rapport between bird and owner and a bird&apos;s natural ability to form a home range. Josh has kept and worked with birds since early childhood and has turned his hobby into a career through the knowledge he has acquired. Over the past five years he has worked to establish a free flying flock of exotic parrots consisting of 30 macaws, a breeding colony of 15 eclectus parrots, 8 red tail black cockatoos and several other species of parrot. 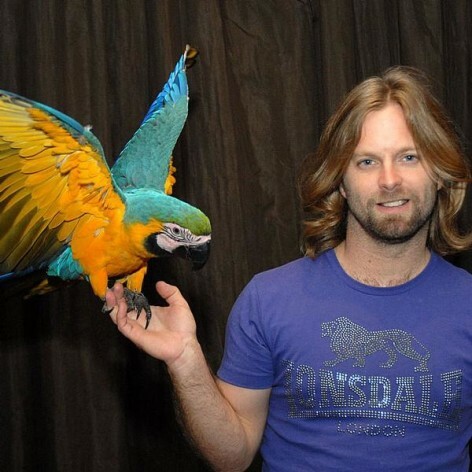 Josh Cook is a 34 year old self taught avian behaviourist, specialising in the art of free flight, a relatively new concept within aviculture and companion bird ownership.